Here's the slide I made showing how the K770i is being unwrapped from its package. Firstly the box , small and petite but cool packaging. When I first saw it on Sony Erricsson site , it says candy bar type phone and I was expecting something like a snicker size phone but is much smaller and slimmer than that. See? 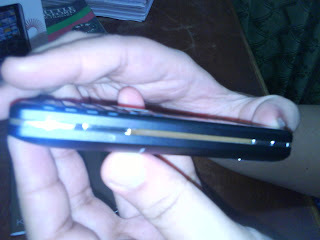 Its very slim and it fits in my palm. The K770i has a 3.2 megapixel CyberShot camera with auto focus along with its picture blogging picture app which helps to move the picture taken to your blog, awesome application for me. And because its so light and slim I keep feeling my right pocket to make sure its there. The Cybershot has a 3.2x digital Zoom for picture close ups which can be further touched up with its Photo Fix app. 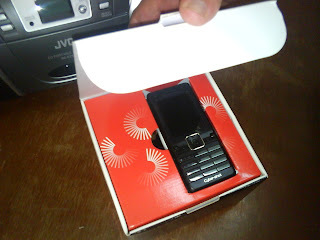 It supports SMS, MMS, Bluetooth and can be used as an Internet Modem by just plugging in the USB cable to the pc and the phone. Aside from that , it has java support games, 3d games, a radio and Walkman player 3.0 which is a media player that plays mp3 files along with some other formats. It has 3G high speed internet conenction for fast data transfer speed (384 kbps) which makes it easy and fast to access the internet. (I finished like RM10 ++ credit already on it cause its just so cool to browse my blog with it). It also does video streaming from the net and RSS feeds. So all and all I am quite please with this new K770i especially for its final party piece which is of course the 3.2 Megapixel CyberShot which Sony is known for. I got a black one as everyone knows black is always in style and never goes old. What to know more about K770i check this link out. You spelled Ericsson incorrectly, it should be one 'r'. 10 points from Hufflepuff. Hi Green Leaf ,Yar i just got it a few days ago.It's a great phone specially the cybershot camera which I'm really digging it. Hahaha, Yes I misspelled ericsson , no spelling be for me i guess..